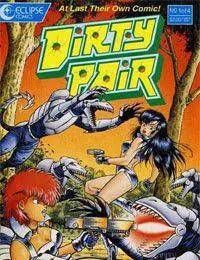 The Dirty Pair is an original English-language manga written and illustrated by Adam Warren, based on the original Dirty Pair characters created by Haruka Takachiho.<br /> <br />The American comic company and manga translator Studio Proteus acquired rights to create comic versions of the Dirty Pair in 1988. The first three limited series, reprinted in the collected editions Biohazards, Dangerous Acquaintances, and Plague of Angels, were published by the since-defunct Eclipse Comics. Later, the rights were transferred to Dark Horse Comics. The first three series were written by Toren Smith and Adam Warren and drawn by Warren — after that, Smith left the project and Warren took over writing completely. These stories have a much more cyberpunk style than the other versions; the later stories, starting with Fatal But Not Serious, move into the transhuman and posthuman subgenres.